It was a nice sunshiny day. There was fun. 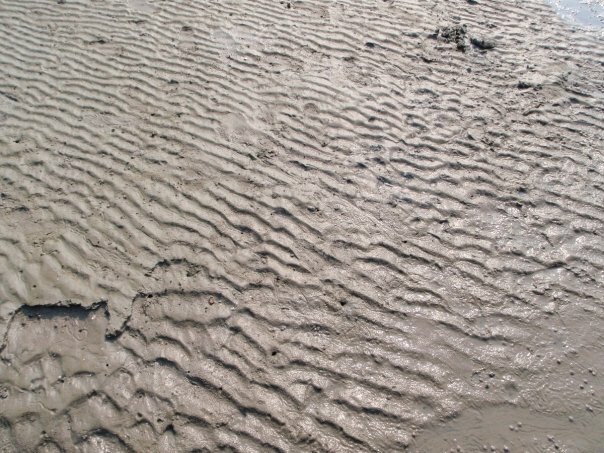 There was sand. There were even lots of little naked kids running around. The only thing that was really missing was the water. 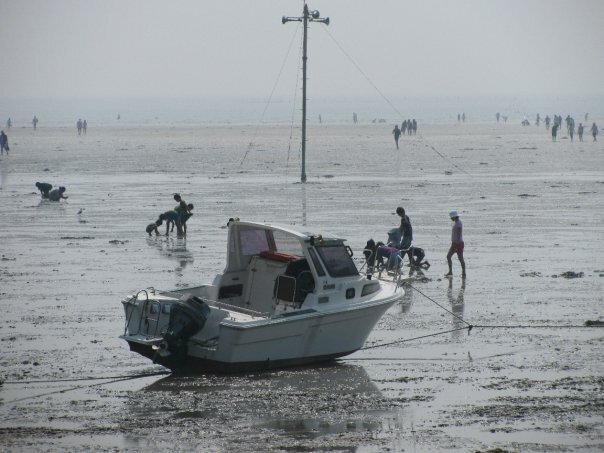 The tide goes out really far on the east coast of Korea leaving behind brown sludge. 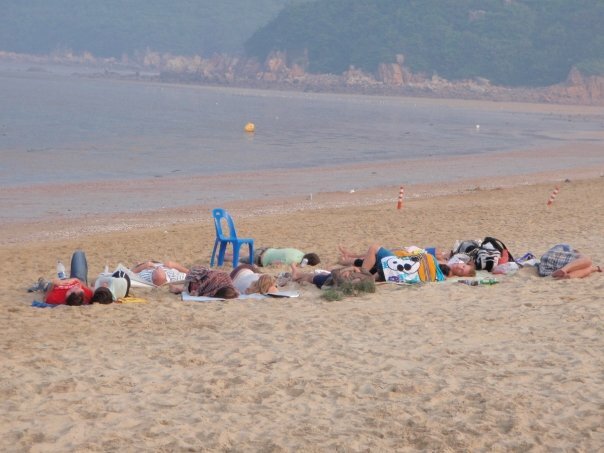 Someone said that the sand on most Korean beaches is imported from China. That seems plausible because the sand under the sea was not sand at all. This was another trip planned by William. When William plans a trip there is lots of food, specifically grilled food. William has a Costco card and can get his hands on fine American cuisine like burgers and nacho cheese. 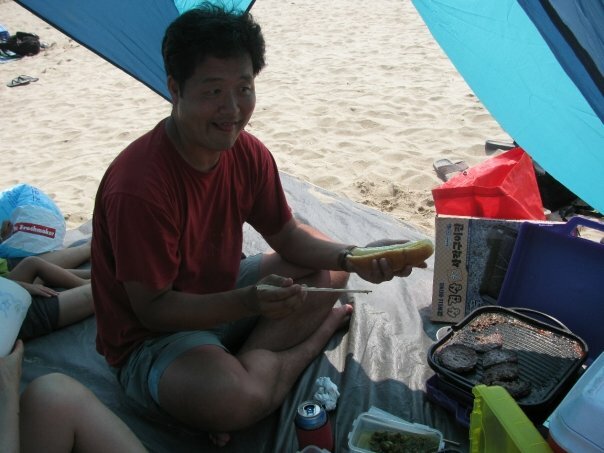 But if you don’t have a Costco card and a William to carry all the food to the beach for you and cook it too, you can simple eat at the restaurant at the beach. They serve seafood and galbi (갈비). If you want to grill your own, the corner store in the park sells raw samgyeopsal (삼겹살) and mini grills. They also sell anything you would ever need except tents, so don’t bring anything that would make your backpack too heavy. “I went horseback riding in Korea.” Now that is a true statement. There were dune buggies to rent and ride, but they didn’t seem like much fun. The area designated for riding was very restricted. Maybe when the beach isn’t so crowded they let you go further. We heard rumors that there were horses at the beach and set off looking for them. At first we couldn’t see them, but we could sure smell them. They stunk! If you ride horses a lot this wouldn’t be worth it for you. I just wanted to get on a horse to get my picture taken, to say that I rode a horse in Korea, and so that I could have something to blog about. It cost 10,000KRW for the short ride and 20,000KRW for the long ride, though the long ride wasn’t very long. I took the short ride which involved the owner running along with the bridle of the horse in hand. They don’t need no stinkin’ tent! We’ll just sleep around this chair. The next morning when I woke up, I saw all the people who slept at the beach without shelter. They didn’t seem to suffer any ill effects from roughing it the night before. In fact, they slept in later than I did. But it might have been because they were still pretty drunk. Brittney and I were the only 2 awake/sober women on the beach that morning. We noticed that William left a lot of food from Costco at the beach. There were hot dogs, hot dog buns. and soda cans everywhere. We felt that since the people from our group left them and they were now gone, it was our responsibility to clean it up. As we were cleaning up we noticed an unopened jar of salsa sauce. Then she found an unopened jar of cheese dip. Then I found a jar of dill pickles. Then we found more salsa and cheese dip and cans of soda; all unopened. My first thought was how to get this stuff back to William; he left before sunset the previous night. But then Brittney said that it was too much trouble to give it back to William, besides he left it here. He wanted us to have it. Since we were the only ones to clean up, we should divide it between us and keep it. Her logic seemed sound to me. Go to Incheon Airport. To get to the airport you can either take an airport limousine which costs about 8,000KRW depending on where you get on or take the subway and transfer to the airport line. The airport line is a bit more expensive than the other subway lines. It costs about 4,500KRW to use. You can use your T-money card on both the airport subway line and the airport limousine for a discount. In the future Incheon Airport will not be the last stop. They are building a new parking lot and the line will someday end there. But until they do, you will have to get off at Incheon Airport and walk over to the departures and arrival area. Go to the 3rd floor and stand between sections 5 & 6. You can use your T-money card to take bus #222 to the Jam Jin Ferry Terminal (잠진도산작천). This bus comes by once an hour and it will be beyond packed during the summer. There is heavy traffic during the peak season so if when you get to the little bridge, the bus isn’t moving much, get out and walk. You’ll get to the ferry faster. 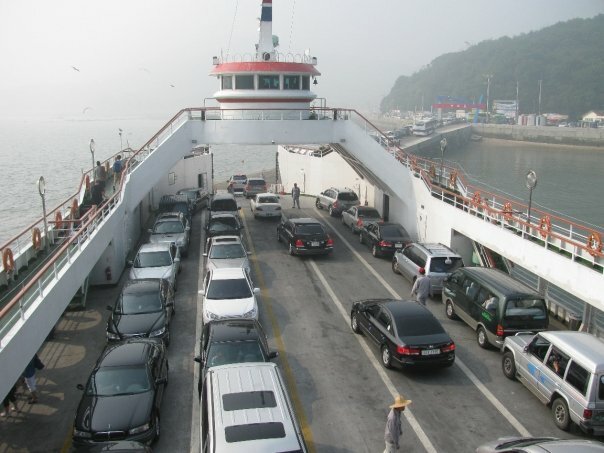 The ferry to Muuido cost 3,000KRW for individuals and 20,000KRW for cars. It doesn’t matter how many people are in the car. The trip is free coming back. 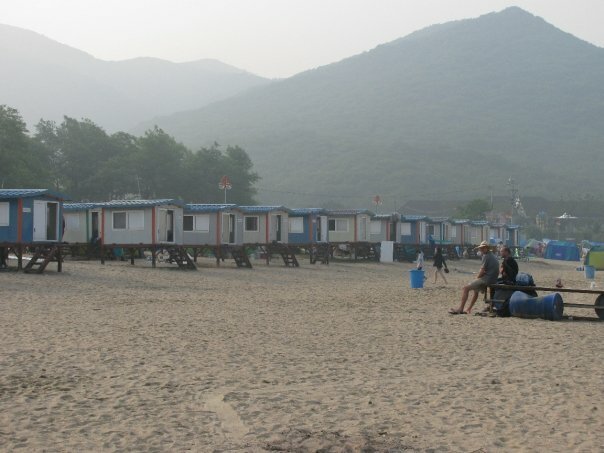 Make sure to have a 1,000KRW note for the bus ride to the beach and another one to come back to the ferry. The bus on Muuido island doesn’t give change and you can’t use your T-money card. 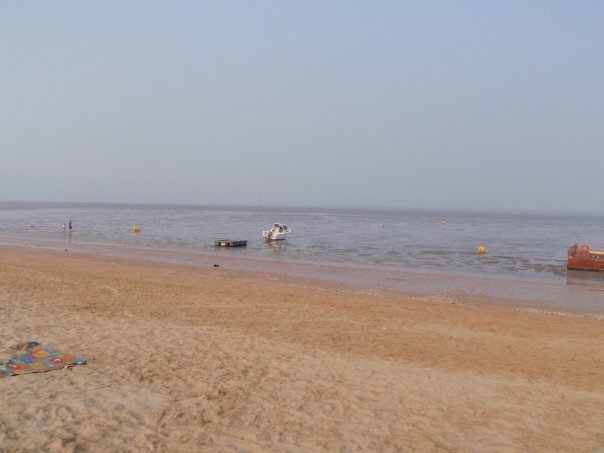 There are bungalows for rent along the beach. They are very small and seem to be worth it more in the spring or fall since they have heated floors. Most people who did not have tents just slept under the stars on nice summer nights. Well, most of the foreigners did… well, mostly the drunk ones. I don’t know how much the bungalows cost. There are showers that cost 2,000KRW to use. They’re not that bad. It seemed to me that most of the people there used the free foot washing area to do all their bathing. If you are not Korean and you plan to do this be prepared to be stared at. There was a time when the gate was closed and no one new could enter the park, but I don’t know what time that was. 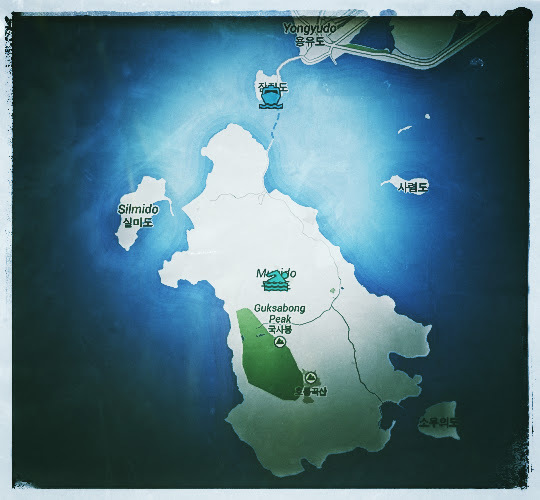 The bus on Muuido Island does not give change or use T-Money cards. You need to use exact change for each ride. It cost 1,000KRW per person per ride. You will need a 1,000KRW note going and another one leaving.